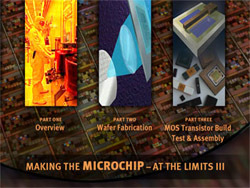 Making the Microchip - At the Limits - III is an overview of the semiconductor processing industry. This 51 minute video course, based on training principles, provides a comprehensive view of the complex manufacturing steps using non-technical terminology and analogies. The most recent advances in IC manufacturing such as the use of copper, chemical mechanical planarization, multi-level metal and high and low-k dielectrics are addressed. Footage taken at major IC manufacturing facilities provides insight into the nature of the dynamic semiconductor industry. Graphics enable the viewer to clearly understand the manufacturing process. This course is beneficial for semiconductor manufacturing employees and suppliers to the semiconductor industry as well as anyone interested in learning how integrated circuits are made. It is an excellent information tool for schools, financial organizations, public relations firms and advertising agencies. Trainer's guide with questions and answers is included.